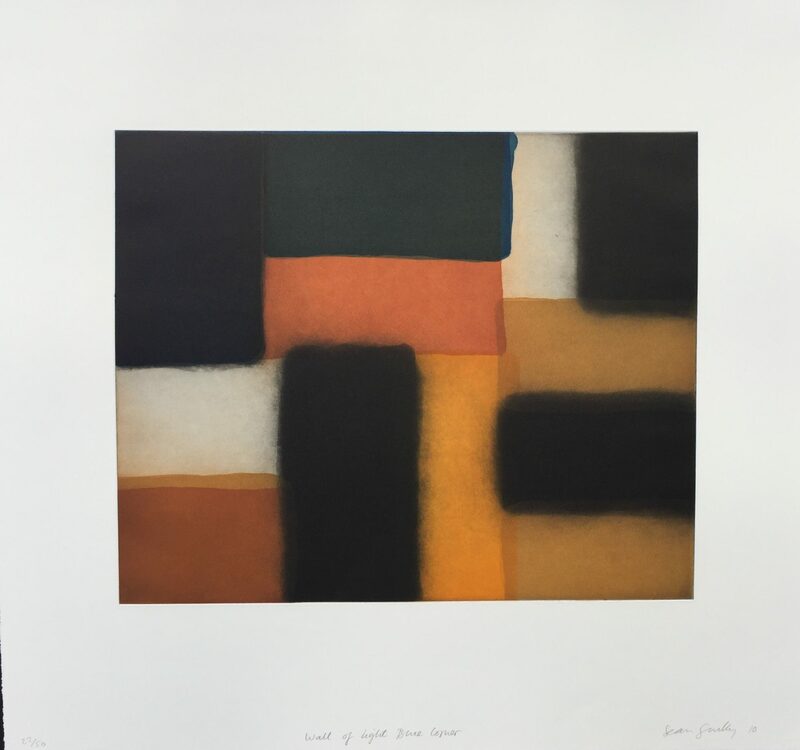 Wall Of Light Blue Corner, 2010 by Sean Scully is an etching with aquatint print. This original print is signed, titled, numbered and dated on the front lower part. “Wall of Light” series was begun in 1998, yet it has its origins much earlier. In 1983–84, while traveling in Mexico, Mr. Scully became fascinated by the southern sun’s play of light on walls, in particular on the monumental Mayan ruins. He made a watercolor to try to capture the sensation, and this was followed by two more. Years later, when his paintings evolved to touch on similar issues, he recalled those watercolors, and the series was born. Mr. Scully’s paintings show the influence of previous generations of abstract painters, most obviously: Mondrian, in the gridlike understructure; Rothko, in the textured color planes of the stripes; and De Kooning, in the graceful, yet decidedly masculine, brushstrokes. Discussing the first of the Mexican watercolors, but describing his ambition for the entire body of work, he has said, “What I’m trying to do in this little watercolor that I made on the beach in Zihuatanejo, is make something that is obviously metaphysical, because I’m trying to turn stone into light.” The genius of “Wall of Light” lies in its realization of the delicate balance suggested in its paradoxical title. The work discovers a meeting point of seemingly irreconcilable opposites — the durable and the fleeting, the impermeable and the diaphanous, the massive and the weightless — and forces us to consider whether something as improbable as a wall of light is actually possible. As always, Mr. Scully’s art is based around the stripe. It has been his signature motif since he first discovered Moroccan textiles more than 30 years ago, his equivalent to Newman’s zip, Rothko’s floating color planes, or Pollock’s drip. Here, the stripes are gathered in groups of two, three, and four to form squares that interlock in an irregular checkerboard of horizontal and vertical blocks. The overall patterns look something like a patchwork of flags. Tiny pathways created by the bristles streak the surface like rake marks in the earth, while small waves of paint build up at the end of every stroke. Every movement of Mr. Scully’s thick 5-inch brush seems visible at first. But the paint is actually layers and layers deep, and as with a thick wall, it soon becomes clear that unseen depths lie beneath the surface. Although the “Wall of Light” works are completely nonrepresentational — they do not depict specific walls so much as the more general phenomenon of light hitting wall — they are full of content, evoking places, times of day, states of mind, and different people. Mr. Scully splits his time among three cities, and the art created in each is shaped by the personality of these locations. The New York pieces, the most common in the show, are often cerebral and ordered. 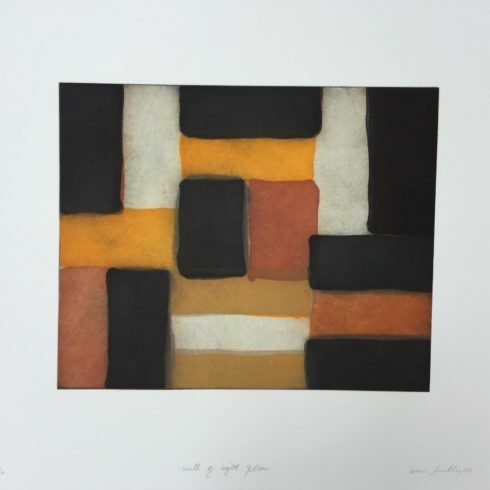 Wall Of Light Blue Corner (2010) etching with aquatint print by Sean Scully.